“Are these really vegan muffins?” When I bake and share these muffins, that’s always the first response. Sometimes, I even have to remind myself that this blueberry muffin recipe is vegan. And if I don’t mention it, no one ever can tell. No Eggs? No problem. Make these blueberry muffins with no eggs. 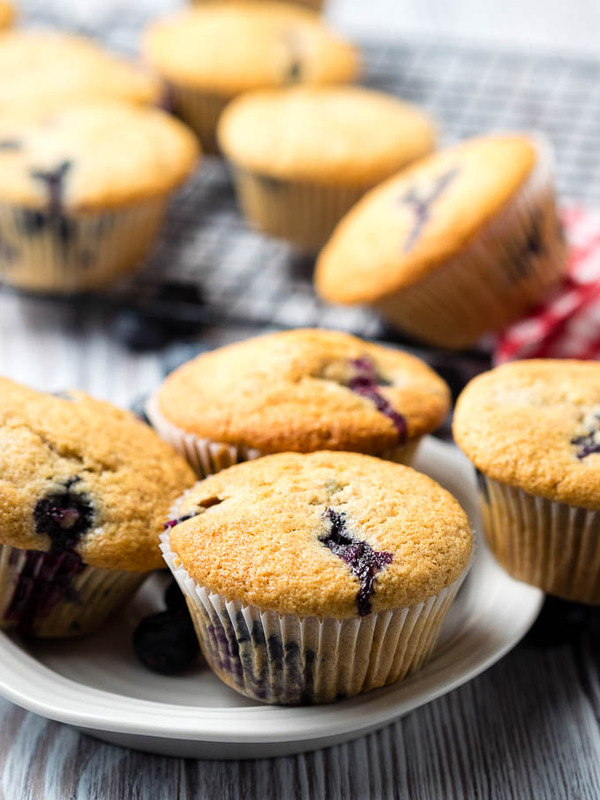 Whether you’re vegan or allergic to egg, or simply do not have any eggs in the fridge, these blueberry muffins without eggs are for you. 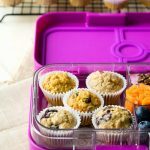 I developed this vegan muffin recipe because my son is allergic to eggs, and intolerant to dairy. 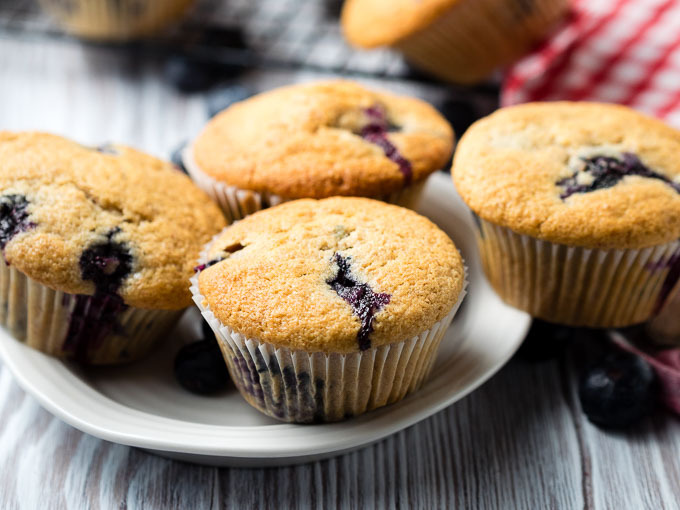 It has become a family favorite, and our go-to egg free blueberry muffins. This isn’t the first vegan or egg free muffin recipe on The Worktop. A couple other favorites are: Egg Free Banana Muffins and Vegan Cinnamon Breakfast Muffins. 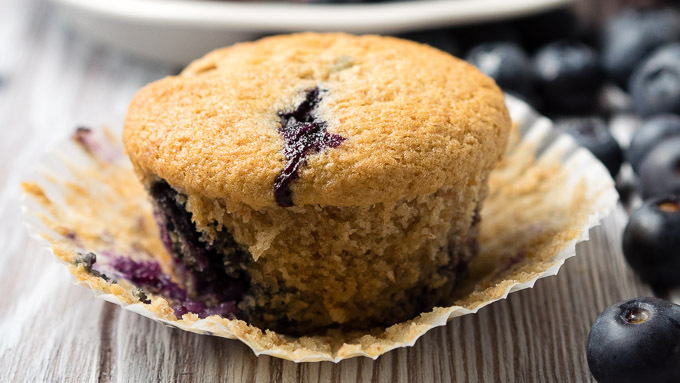 Vegan Blueberry Muffins: fluffy, moist, healthy(ish), and simple to make. An all around win. 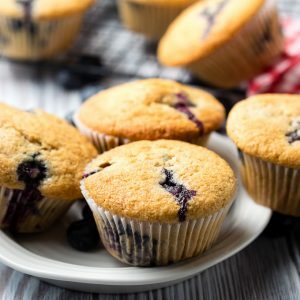 These vegan blueberry muffins are spot on! they are not too sweet. Just look at that soft texture of the muffin! It’s bursting with blueberries with every single bite too. To get this perfect muffin texture, make sure you don’t over mix the batter. While some muffin recipes may tout a one-bowl approach, I find the best result if you combine the dry and wet ingredients separately. That way, you don’t risk over mixing the batter because you’ve done all the mixing of the dry ingredients beforehand. 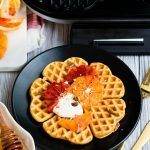 When I was developing the recipe, I initially added a bit of spelt flour in the recipe to make it a tad healthier. But after doing so, I realized that the spelt flour also adds just the perfect little bit of texture to the muffins. Not overwhelmingly so, but enough that I definitely prefer it with the spelt flour. 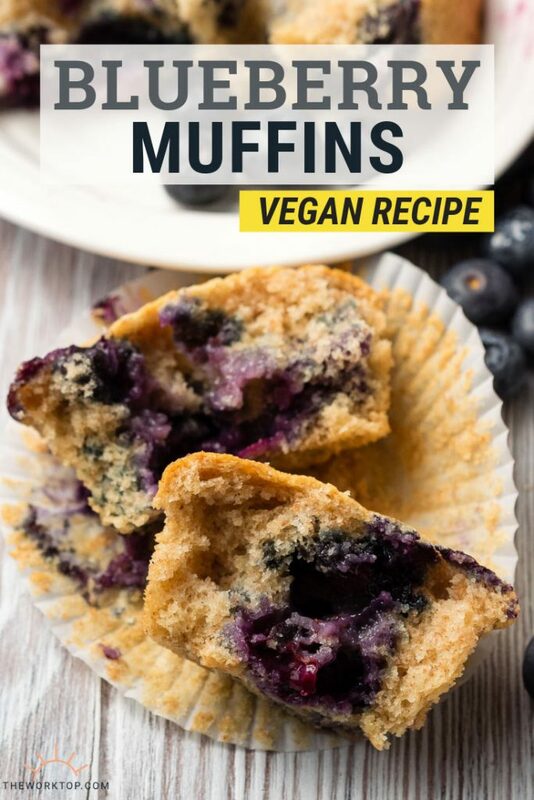 You can make these vegan blueberry muffins without the spelt flour, but I highly recommend you make it with. 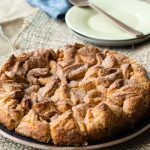 Like in this recipe, it’s easy to use a combination of all-purpose flour and spelt flour in recipes to make most recipes a bit healthier (we do it all the time!). 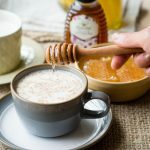 You can find spelt flour in your local health store, but Amazon conveniently carries spelt flour at a great price. Muffins in sugar is always my nemesis. Store-bought muffins are loaded with sugar. Even homemade muffin recipes are packed with sugar. 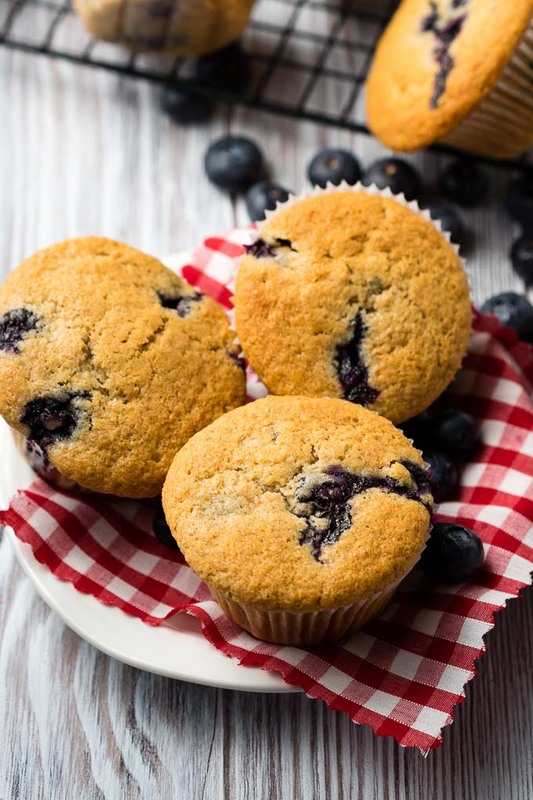 For example, one famous cookbook’s blueberry muffins recipe contain 1 1/4 cups white sugar in the batter, plus a note that it’s optional to top with more granulated sugar. 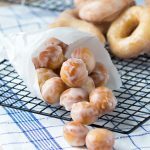 This recipe uses between 1/2 cup to 3/4 cup sugar, and relies on applesauce to add a bit of natural sweetness. 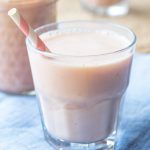 TIP: To find an apple sauce that doesn’t have added sugar or flavors, I always keep baby food apple puree like this one in my cupboard, because it doesn’t contain any added sugar or water and is shelf stable. I don’t cut out sugar completely because I like the moistness it adds to the muffins, and the golden color it lends to the muffin tops. But this recipe shows you that you can make delicious muffins with less sugar than normal. To be honest, at first these muffins looked a bit flat to me and I wanted to keep working on the recipe to perfect it more. 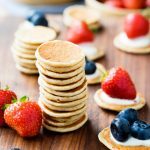 But after a few tries, and a few batches of these, I realized that the beauty of these flatter tops meant that these muffin tops are evenly browned and delicious. 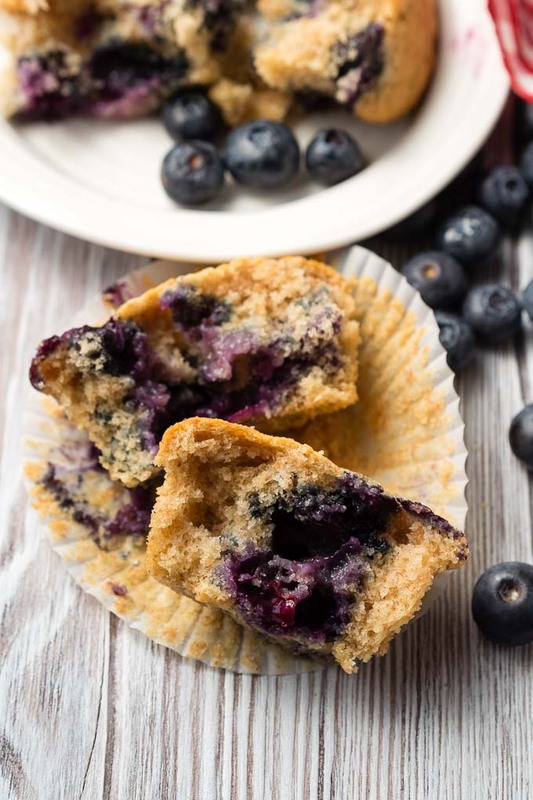 Sometimes, you’ll find recipes that tell you to reserve some blueberries to hand place on top of the muffin batter once it’s in the muffin tin. This recipe doesn’t require that, so you get just a bit of the blueberries poking through. What this also means is that you get more pure “muffin top” texture. Win! Preheat the oven to 375°F / 190° C. Line a 12-cup muffin tin with paper liners. 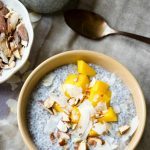 In a small bowl, mix together the oat milk, apple sauce and cider vinegar. In a medium bowl, mix together the dry ingredients. Make a well in the dry ingredients. Pour in the wet ingredients and mix until just combined. Mix in the melted coconut oil. Gently fold in the blueberries. Evenly distribute the batter into the 12 muffin cups. Bake for 22-25 minutes, until the muffins are golden on top and a toothpick inserted into the middle comes out clean. Remove from oven and after a few minutes, transfer to a cooling rack to cool. 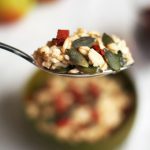 Enjoy warm, and store any leftovers in an airtight container. 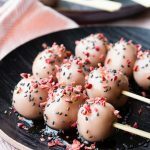 If you are thinking about using frozen blueberries to make this recipe, this article gives great tips on how to minimize bleeding blueberries.